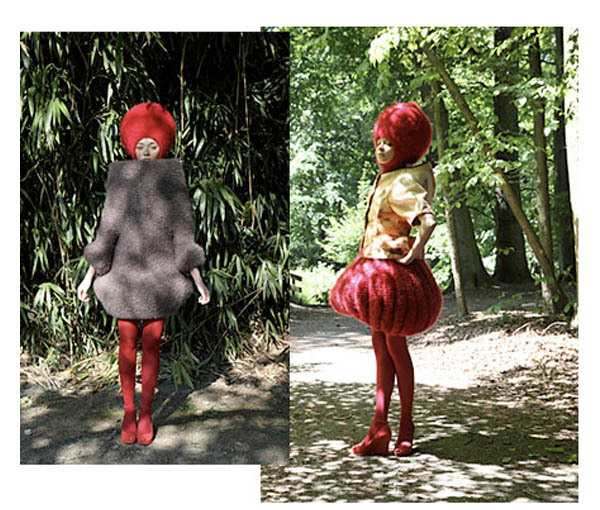 MA Antwerp graduate Nathalie Fordeyn designed a fascinating collection called, “A Drummer In A Tree”. More like “A Q-tip in an Ear”. (I’ll show my way out…) Anyway, I find this collection refreshing because who knew grandma’s sweaters would look so cool wrapped around your head like a fishbowl? Personally, I’m a fan of knit-wear even though California weather never lets me unleash my knit collection, like ever. I can totally appreciate the time and energy to make these bulbous pieces. I’m digging the dome skirts, but fear that they may make my legs look thick. That’s the problem with knitwear, you have to be super skinny to wear it or you’ll just look like a cat lady from Minnesota that cites peanut butter as their favorite ‘food’. Having said that, I’d totally wear the second to the last photo in a blizzard. Hahahaha, hilarity. I love this. I want to see a movie featuring a race of q-tip headed peoples. I guess it could be worse! I was very excited to discover your works of art in the 2010/2011 winter edition of the FibreArts magazine. I would like to invite you to enter the 2011 World of WearableArt (WOW) competition held in Wellington, New Zealand. WOW is an annual Awards show that twists the conventional perception of both art and fashion and weaves them into a performance. WOW is one of the most prestigious art and fashion shows on the planet with more than $150,000 in prize money. Designers from film, fashion, photography, design , sculpting and art worlds are inspired to enter. Please view our web site http://www.worldofwearbleart.com for information on how to enter.